Motion is the movement of a body. If a particle moves in a two dimensional coordinate system, that is in a plane, both of its coordinates change and the motion is two dimensional motion. If the particle movies in space, that is in a three dimensional coordinate system, the motion of the particle is three dimensional. In everyday life you may think the distance and displacement are the same things but they are totally different in physics. Distance is a scalar quantity and displacement is a vector quantity. Being scalar distance does not have any particular direction associated with it but displacement has direction. Figure 1 The displacement is the straight line between the initial and final position which has a direction towards the final position; it does not go into the details of the path of motion. But distance is the total length of travel whether that is a curve or a straight line. In Figure 1 a particle moves from the initial position $s_1$ to the final position $s_2$ along the curved path. 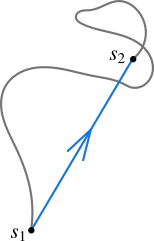 In this case the distance represents the whole path of motion but the displacement only depends on the initial and final positions. Therefore, the displacement is the straight line joining the two positions which has direction towards the final position from the initial position (as the particle reached the final position). In other words the displacement does not depend on the details of motion of the particle. If you consider this information in a coordinate system, if the initial position vector of point $s_1$ is $\vec r_1$ and the final position vector of point $s_2$ is $\vec r_2$, the displacement is $\Delta \vec r$ = $\vec r_2 - \vec r_1$. A position vector is simply a vector representing a particular position in a coordinate system.